Forgiving does not mean you have to agree to something you don't believe in; it just means you're willing to let go the old and move forward to a new. If you and someone are on a different page at this time, allow each other the free will to choose and the lessons that follow. Let the other learn from their choices and evolve at their own pace. Don't try to control it—it is not up to you to decide the pace at which the other person evolves. What is up to you, however, are your deliberate choices to better your own being. Bear in mind that when you hold a grudge, you are in essence holding on to all the negative feelings that come with it. These toxic feelings are yours—not someone else's; they belong to you because you are the one holding on to the grudge. To achieve true wellness, you must first let go of this toxicity by letting go of the grudge. Forgive. And no, you do not have to be a part of something you don't agree with in order to forgive. You can move on, turn a different page, find something that serves you better, while also having forgiveness in your heart. So forgive and forget-the-grudge, however, always remember the lesson! We do not attract what we want; we attract what we are. Consequently, the universe offers us experiences that match our giving, supportive nature or lack of it. The way you pay attention to the world can make a huge difference in the way you experience it. So if you really want to see change for the better, you must first be the change you are seeking. Be aware of where you focus most of your attention. Remember: You are the product of your thoughts; loving thoughts make you kind, miserable thoughts make you a downer, joyful thoughts make you spread more light. So how do you spend most of your thoughts? This coming 2013, do yourself a favour—give the gift of Forgiveness. Start by forgiving yourself... And if there's someone you're contemplating on forgiving, this is the time to do so. You deserve to nourish your spirit with this empowering choice. Do not settle for anything less! Here's why you should NOT bounce during your stretches! I've seen too many people vigorously bounce their body one way or another in order to try and reach further, or bend into position more. Not a good idea! Find out why on this quick tip video. While you're here, why not click here to learn how to stretch all your major muscles safely (without pain). A single moment of misunderstanding can be so poisonous that it makes us forget the countless loving moments that existed. From today onwards, keep this in mind if you should decide to stay angry at someone. Ask yourself if it's truly worth keeping anger in your heart—contaminating your spirit. Or is it better to forgive, walk away from the old, and move forward into a new. The gift of forgiveness can be the most enriching gift you could offer... to yourself, and to the other. Hope you enjoyed Week 4 of the 10-Minute Body Burn with Me. Get the full details on Week 5 workout here. - 60 seconds - 3 lateral jump squat (reaching down outside the foot); climb forward into 4 spider climbers; climb back up and do 1 knee tuck; climb back forward into 2 push ups with shoulder taps. Repeat this giant set 3 rounds back-to-back with little to no rest. Want to start over at Week 1? Click here for WOW 1: Fat-Burn Cardio and Strength Training. Ready for more than that? Try some of the many other fat-burning 10-minute *WOW workouts here. Take your pick! Learn some simple stretches you can execute anytime to alleviate discomfort in your back, and keep you feeling more relaxed and less stressed. Most people complain of a stiff or sore back, and they feel helpless. While they wait around hoping to feel better, they continue to feel more and more discomfort and tightness until one day, one simple movement is enough for them to experience an injury. And so you can see how this "snow-ball effect" begins and continues. P.S. While you're here, why not learn to stretch all the major muscles in your body? Try it here: How to Stretch All Your Major Muscles Without Pain. Many people do not know how to execute a proper push up. Even if you're an "advance" or think you're pretty good at it, you should watch this video to make sure you're actually doing it correctly so you don't experience pain or injury down the road. If you're new to push ups or have never been able to do them perfectly, this is a great place to start so you don't pick up any bad habits. Learn to do it correctly! You can get really good at doing push ups by watching this video now! Want more challenge? Check out 7 Ways To Challenge Your Push-ups. P.S. Now that you know how to do a push up properly, why not workout with me? :) Click here to try one of my 10-Minute Fat-Burning Workouts. Hope you enjoyed Week 3 of the 10-Minute Body Burn with Me. Get the full details on Week 4 workout here. When it comes to getting fit and lean, your body responds to quality over quantity. Learn to super-charge your workouts so you can burn fat, lean out and strengthen up while also cutting your workout time short. Let's workout together. Just do your best! As long as you're doing your best, you'll always get better. Let's get to it right now! Repeat this set 2 rounds back-to-back with little to no rest. Do you lift others up or bring them down? No matter who you are or what you possess, each and every one of us have our own battles to fight. You may be good with family, but terrible in business; you may be great at making money, but can't seem to get yourself to workout and stay healthy; you may be excellent with people, yet find it hard to keep your relationship in order. Whatever it is, we all have our strengths and weaknesses, and we are all here to help each other achieve a satisfying balance. Even good people can make bad decisions or become desperate when push comes to shove; even well-intentioned people can find themselves in disappointingly tempting situations. As long as we are here, we all live under the same Universal Law of Impermanence, that is to say, nothing is permanent — the only permanence in life is change. You could have it all one day and lose it all the next. Nothing is ever for sure. So do not pass judgments. You may very well be one of those "good people" who say "that would never happen to me" or "if that were to happen, I would never...". I've come to learn that you can never say never unless you were actually faced with that exact same circumstance you are referring to; you may be suprised with your own actions when desperate times call for desperate measures. So let's face it, no matter your age or status, you will make mistakes; you may repeat mistakes; some of you still don't get it; some may get a few things "right" sooner than later; but eventually, most of us will get it "right" enough. To live a life in harmony would then be to observe with compassion. 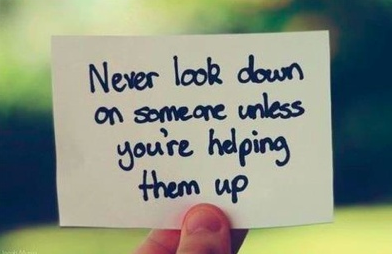 It would be wise to not look down on someone unless you're helping them up. Remember: Judging a person does not define who they are...it defines who you are. Happy 12.12.12 - Do something for yourself! This is the last day of the millennium with the same numeric day, month, and year. 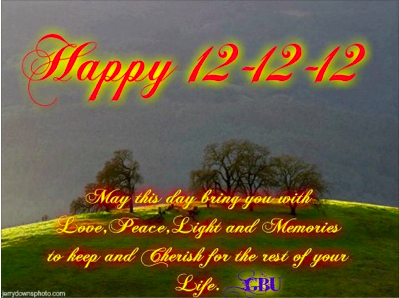 It'll be another 1000 years before you see 12.12.12 again. Time will fly. You and I will not be here to see that (at least not in the same lifetime) ;). So enjoy this special day and make a promise to do something great for yourself (i.e. be kinder, do something that scares you, try something you never tried before, forgive someone, give your time to someone). - yes, I do eat A LOT. - no, I don't workout everyday (maybe 3-4 times a week). - no, I don't workout for hours (I stick to short 30-minute intense workouts and I always stretch after). - yes, I sometimes like to take a short 10-15-minute power nap. - no, I don't need the nap (but I choose to have it because they give me a BURST of energy as though I just woke up from a good sleep). - yes, I get around 6 hours of sleep a night (sometimes 7-8 hours depending on my schedule). Either way, that's more than enough for me. - yes, I LOVE having wine with dinner. - yes, I have a "sweet tooth." - yes, I indulge in savoury desserts 2-3 times a week. - yes, I have a little low-fat yogurt ice-cream almost everyday if I don't have my dessert. - no, I don't feel bad about it. - yes, I do sometimes just drop down right on the spot (at home) and do burpees with knee tuck jumps and pushups if I know I'm going to eat "bad." - no, I don't feel silly doing that! - yes, I eat "bad" 2-3 times a week. - yes, I eat "good" 4-5 times a week. - no, I don't drink coffee, but I do drink my Matcha green tea every day. - yes, I always squeeze fresh lemon in my water (I drink at least 8 glasses of water a day). - no, I don't drink pop (AT ALL). - yes, I practice deep power-breathing here and there throughout the day (in the car, in the morning, before bed). - no, I don't like to take any kind of over-the-counter or prescription drugs to combat any discomfort (not even Advil). - yes, I like to choose the most natural alternative if I feel discomfort of any kind (but I rarely feel any discomfort in my body). - opps, I just lied! :) Okay, I admit, sometimes I feel discomfort; my muscles may feel sore after a crazy workout (but this kind of discomfort is one that feels SO DARN GOOD!! lol). So no, I am not "perfect." As you can see, I drink, I like sweets, I don't always get enough sleep, I don't do long workouts — but I do make an effort to create the best balance I can and enjoy everything in moderation. And yes, my approach to wellness and fitness is about creating a balance that works for you and only you—not everyone. Because every "body" is a little different, what works for one may not necessarily work for another. But here's the common denominator that works for ALL no matter what your body type — and that is, you can enjoy, but you MUST cooperate with your body. Don't just do enough to survive, but do more to help your body thrive! Try new ways, test things out for yourself, consult with a professional. The key is to find your own balance and enjoy the process. 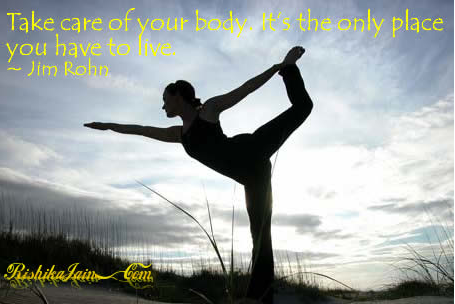 If you take care of your body, it will take care of itself. Hope you enjoyed Week 2 of the 10-Minute Body Burn with Me. Get the full details on Week 3 workout here. This short workout is just what you need to burn fat, rev up your metabolism, mean up those lean muscle mass and boost your energy level like never before. :) Let’s go! Let’s workout together right now! Repeat this set 3 rounds back-to-back with little to no rest. Try to get good at this workout and then feel free to do it twice to make it a 20-minute workout for more calorie burn. Or you could always do one of the other *WOW workouts following this *WOW just to keep things different and exciting. Cells are the basic building blocks of life. You are nothing but cells — every organ, every bit of tissue is made up of cells. The number one thing that will make your cells weak is decreased workload. Making less demands on your body makes cells atrophy and weak. The way to get weak in anything is don't challenge yourself anymore. The reason people get fragile and their bones get weaker is because they don't challenge anymore. People who are most physical make the biggest demand have the greatest strength—whether it be the muscles, the mind, the human emotion, the spirit. When you're challenged, you use your courage, and it gets bigger by demand. But when you don't use it, it gets weaker; it's the law of life: If you don't use it, you'll lose it. Today, I want to challenge you to devote a little time everyday for this entire week doing one thing that challenges you. It doesn't have to be anything major—something small is just fine... I challenge you to experience for yourself how this deliberate intent on your part will positively shift you at the end of the week. This short workout is just what you need to burn fat, rev up your metabolism, mean up those lean muscle mass and boost your energy level like never before. :) Let’s get it done, right here, right now! Do try to get good at this workout and then feel free to alternate between *WOW 1 and *WOW 2 to keep things exciting. And don’t be afraid to do more than one of these 10-minute workouts back-to-back, or on the same day. If you're ready for *WOW 3 join me here for Body Fat Be Gone: Cardio and Strength Training (Week 3).